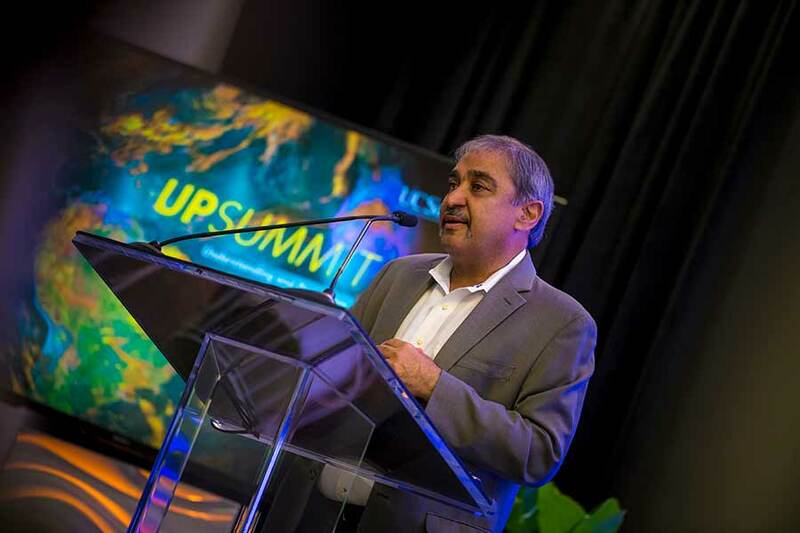 UC San Diego Chancellor Pradeep K. Kholsa welcomes attendees at the UP Summit. 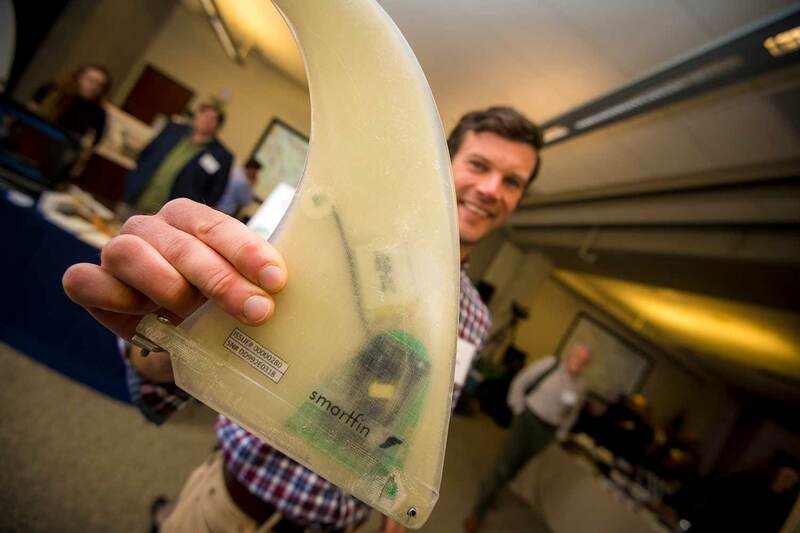 This research was showcased May 17 at the inaugural UP Summit, to inspire a dialogue about how UC San Diego researchers are contributing to find solutions to environmental challenges. This research to understand and protect the planet is a cornerstone of UC San Diego’s strategic research themes identified during the university’s strategic planning process in 2014. This plan identified where UC San Diego has the best experience and most potential for positively impacting society and the environment. The invite-only audience at the UP Summit was comprised of a group that can take this research and turn it into action—political leaders, elected officials, agency and tribal representatives, non-profit partners and philanthropic supporters. 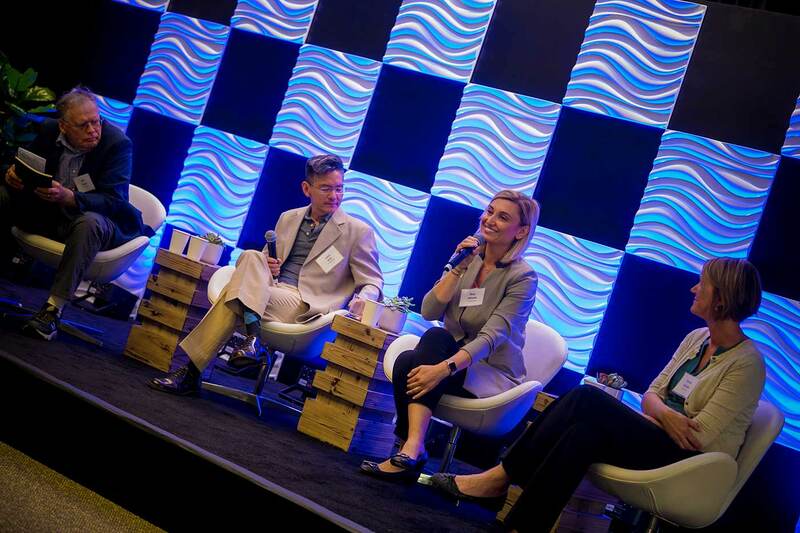 The summit featured two panel discussions on key issues affecting Southern California. The first was moderated by Mark Merrifield, director of the Center for Climate Change Impacts and Adaptation at Scripps Institution of Oceanography, and addressed extreme weather and atmospheric rivers, which can bring most of California’s water supply in only a few weather events a year, and pollution transport via the oceans and atmosphere. The panelists—coastal oceanographer Sarah Giddings, atmospheric chemist Kim Prather, and project scientist Aneesh Submaranian of the Center for Western Weather and Water Extremes—spoke on the how their research is interconnected, and where more research needs to be done to understand complex problems. UC San Diego researchers Dan Cayan, James Nieh, Ilkay Altintas and Kristen Guirguis participate on a panel interdisciplinary research around climate change, wildfire modeling and ecological impacts in our region. The second panel discussed issues on land—including concerns about what pesticides are doing to the honeybee population, climate change impacts to the region, and how improved collaboration between fire departments throughout the state has led to better wildfire monitoring and modeling. Moderated by Keith Pezzoli, who directs UC San Diego’s Urban Studies and Planning Program and the Bioregional Center for Sustainability Science, Planning and Design, panelists included Scripps climate scientists Dan Cayan and Kristen Guirguis, ecologist James Nieh, and data scientist Ilkay Altintas. 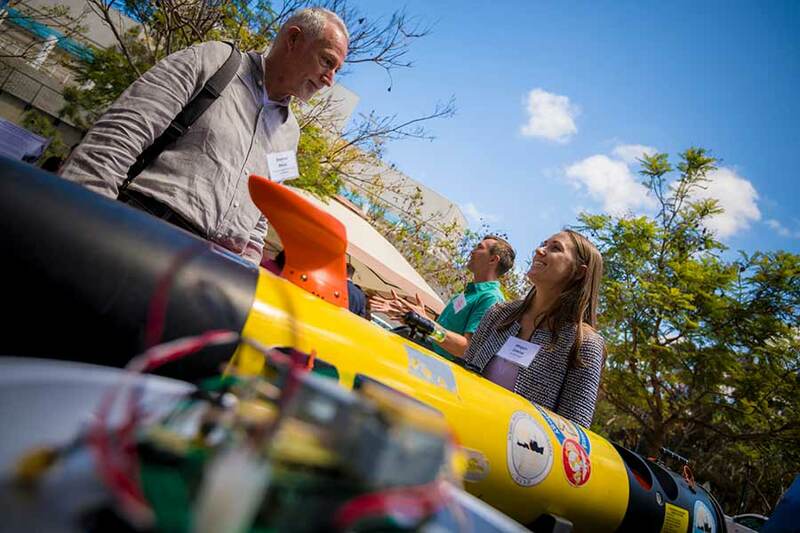 Scripps Institution of Oceanography postdoctoral scholar Megan Cimino (right) speaks with Steven Wertz, an environmental scientist with the California Department of Fish and Wildlife, about remote operated vehicles used in research. The science and technology showcase was part of an expo held at the UP Summit. Altintas spearheads WIFIRE, a program that merges observations and data with computational techniques to predict where and how fast a wildfire will spread. This interdisciplinary research is now paying off, through direct partnerships with fire departments throughout the state, including a Los Angeles County fire chief that tracked down Altintas to collaborate after learning about her work. Altintas provided predictive maps for the 2017 fires from Napa to San Diego County to assist first-responders by creating simulations of the spread of wildfires. Attendees were able to see this science and technology in a hands-on expo. Expo stations included information on UC San Diego’s algae biotechnology innovations, demonstrations of LiDAR technology monitoring and tracking coastal cliff erosion in San Diego County, and instrumentation used in the ocean to measure waves and ocean temperature and monitor ocean coastal conditions. According to event organizers, the goal of this summit was not just to show off the work that was done, but to foster a dialogue between the researchers and the policy makers. The approximately 100 attendees were given opportunities to network and converse throughout the event. The hope is that by learning more about what the science is capable of and what they community needs are, more solutions can be put into action to protect the planet for future generations.